JNN 20 April 2014 Islamabad : The head of a group banned by the Pakistani government as a terrorist organization has won a seat in parliament following an election tribunal’s decision, officials said Thursday. 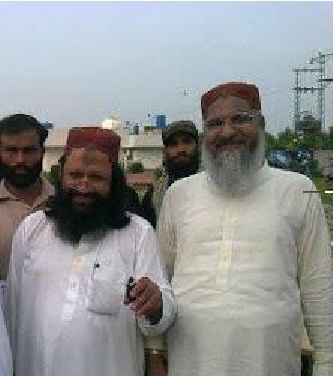 Maulana Ahmad Ludhianvi, who leads the sectarian Terrorist Organisation Ahle Sunnat Wal Jamaat (ASWJ) ( Previously Known as Sipah e Sahaba Pakistan – SSP ) , won an appeal after losing the seat at Jhang in Punjab, Pakistan’s most populous province, during last May’s general election. The Saudi Funded Wahabi Organisation ASWJ widely seen as a front for Sipah-e-Sahaba Pakistan, a group formed in the 1980s , under the Patronage and Support of then Dictator and Killer of Thousands of Innocent Pakistanis , General Zia Ul Haq , and responsible for murdering hundreds of Shiite Muslims . The interior ministry banned ASWJ as a terrorist group in 2012, but it operates freely in Pakistan and its banners are frequently seen at rallies. Ludhianvi ran on the ticket of the six-party religious alliance Muttahida Deeni Mahaz (United Religious Front), which did not win any seat in the May 2013 vote. Shaikh Mohammad Akram of the Pakistan Muslim League-N party, which came to power nationally in the election, won the ballot in Jhang. But the tribunal disqualified him for rigging the vote and defaulting on a loan. “A tribunal gave its decision yesterday and de-seated the winner Shaikh Mohammad Akram and declared Maulana Ludhianvi the winner, who was the runner up in the election,” Mehboob Anwer, election commissioner for Punjab province, told AFP. It should also be noted that under the constitution of Pakistan , any Member of Banned Terrorist Organisation , can not Hold any Public Office , or even conduct any Public Meeting , but here on the Contrary , the Election Commissioner Not Only Ignored , His Contesting as a Member National Assembly, but on the contrary he also declared him as the Winner , While if even any Seat falls vacant , due to the disqualification of any constestant , then the Bye Elections are conducted for the same Seat , But in this case the Election Commisioner not only Authorised the head of the Banned Terrorist Organisation to contest Election , but also declared him as a Winner. As it looks that the Grant or the Aid of US$1.5billion from Saudi Arabia , has started to show its Color , and now all the Negatives are showing the Positive sign , and if there is no check then One day even the Pakistani Army will be sent to their Barracks , and Taliban will be called in to Run the Affairs of the Defence and Security of the Country. Younas Qasmi, a close aide to Ludhianvi, said Ludhianvi had appealed against Akram because he was a loan defaulter who cannot contest elections under Pakistani laws and had also rigged the election. Akram told AFP he would challenge the tribunal’s ruling in the Supreme Court. ASWJ is known as the political arm of Lashkar-e-Jhangvi, one of the most active terror groups in Pakistan and responsible for a string of bloody attacks on Shiites. And is also a close aide of Tehrik e Taliban Pakistan (TTP) , which is working as a Mother Organisation of all the Terrorist Organisations working against the Pakistani Nation and Islam. Ahead of last year’s election Ludhianvi said he wanted to be elected so he could spread what he called his “anti-Shiite mission” to a national audience. This entry was posted in Asia Pacific, Jafria, Pakistan News and tagged Ahmad Ludhianvi, Ahmed Ludhianvi, Banned Organisation, Mohammad Akram, pakistan, Sipah e Sahaba Pakistan SSP, Sipah-e-Sahaba Pakistan, terrorist organisation, Terrorist Organisation Ahle Sunnat Wal Jamaat. Bookmark the permalink.